Vancouver, B.Câ€� Corvus Gold Inc. (“Corvus” or the “Company”) - (TSX: KOR, OTCQX: CORVF) announces results from five additional reverse circulation (RC) holes from the ongoing 2013 drill program in the North Sierra Blanca area (NSB), North Bullfrog Project, Nevada. Four of the holes, NB-13-221 through NB-13-224, were designed to expand ‘in pit’ mineralization while drill hole NB-13-226 was designed to test the western extension of the main Sierra Blanca deposit (Figure 1). Â Drill results received to date from North Sierra Blanca demonstrate good continuity of mineralization that is significantly higher grade than the currently modelled Sierra Blanca pit (PEA NR13-13, June 4, 2013). A new vein system discovery, named the 222 Zone, was identified at Hole NB-13-222 and indicates the potential for another major high-grade system within the resource expansion area. Hole NB-13-222 was drilled to a depth of 375 metres and represents the deepest hole drilled at the North Sierra Blanca area. Significantly, the lower intersection of NB-13-222 ended in mineralization (12.2m @ 1.14 g/t gold & 2.08 g/t silver) which was associated with extensive quartz stockwork veining similar in character to the proximal stockwork zones around the high-grade feeders of the Yellow Jacket Zone 200 metres to the east. Subsequent core drilling is being planned to further delineate this newly discovered vein system. Hole NB-13-224 intersected 24m @ 0.63g/t and 30m @ 0.53 g/t gold and shows the potential as exploration moves north. 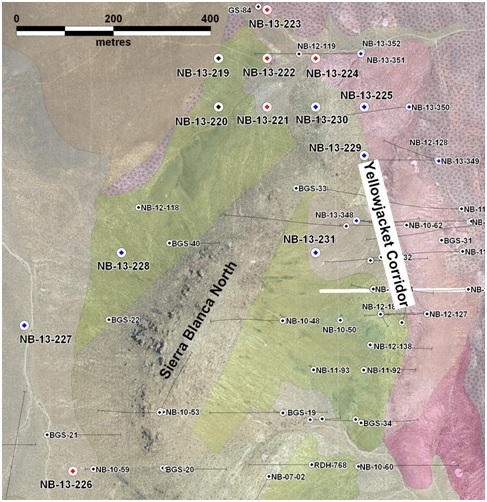 Mineralization in the new NSB holes is hosted primarily a in rhyolite dome feature which is a more favourable host rock for vein development and distinct from the Crater Flat Tuff hosting the lower grade deposit to the south in the current Sierra Blanca deposit. Â In addition, holes NB-13-221, NB-13-222 and MB-13-224 each encountered vein related mineralization in structural zones with >10m of approximately 1 g/t gold expanding the feeder vein targets in the north area. *Intercepts calculated with 0.1g/t cutoff and up to 3m internal waste. Assuming that the mineralization is roughly stratiform in character the intercepts are approximately true thickness. All holes are vertical. Figure 1: Location of new reverse circulation at North Sierra Blanca. Red collars indicate assays reported in Table 1. Blue collars are holes that have been drilled but have assays pending. The objective of the 2013 reverse circulation drill program at North Sierra Blanca is to expand the mine resource base in this higher part of the deposit as well as map the distribution of higher grade vein related mineralization for follow up core drilling on high-grade Yellow Jacket type structural zones. The 100 metre grid spacing designed for initial resource definition will also provide critical geologic and assay information that can be linked with the detailed geophysics for the targeting of additional high-grade structural zones. The fact that three of the four holes reported here encountered higher grade zones suggests that there is high potential for the delineation of more Yellow Jacket type zones within the overall large and expanding NSB target area. Corvus controls 100% of its North Bullfrog Project, which covers approximately 70 kmÂ� in southern Nevada just north of the historic Bullfrog gold mine formerly operated by Barrick Gold Corporation. The property package is made up of a number of leased patented federal mining claims and 758 federal unpatented mining claims. The project has excellent infrastructure, being adjacent to a major highway and power corridor. The Company’s independent consultants completed a robust positive Preliminary Economic Assessment on the existing resource in December 2012.